Locations of current ECAC Hockey member institutions. ECAC Hockey is one of the six conferences that compete in NCAA Division I ice hockey. The conference used to be affiliated with the Eastern College Athletic Conference, a consortium of over 300 colleges in the eastern United States. This relationship ended in 2004; however the ECAC abbreviation was retained in the name of the hockey conference. ECAC Hockey is the only ice hockey conference with identical memberships in both its women's and men's divisions. ECAC Hockey was founded in 1961 as a loose association of college hockey teams in the Northeast. In June 1983, concerns that the Ivy League schools were potentially leaving the conference and disagreements over schedule length versus academics caused Boston University, Boston College, Providence, Northeastern and New Hampshire to decide to leave the ECAC to form what would become Hockey East, which began play in the 1984–85 season. By that fall, Maine also departed the ECAC for the new conference. This left the ECAC with twelve teams (Army, Brown, Clarkson, Colgate, Cornell, Dartmouth, Harvard, Princeton, RPI, St. Lawrence, Vermont, and Yale). Army would stay in the conference until the end of the 1990–91 season, at which point they became independent (they now play in Atlantic Hockey) and were replaced by Union College. Vermont left the ECAC for Hockey East at the end of the 2004–05 season, and were replaced in the conference by Quinnipiac. The ECAC began sponsoring an invitational women's tournament in 1985. ECAC teams began playing an informal regular season schedule in the 1988–89 season, with the conference officially sponsoring women's hockey beginning in the 1993–94 season. ECAC teams won two of the three pre-NCAA American Women's College Hockey Alliance national championships, New Hampshire winning in 1998 and Harvard in 1999. The ECAC was the only Division I men's hockey conference that neither gained nor lost members during the major conference realignment in 2011 and 2012 that followed the Big Ten Conference's announcement that it would launch a men's hockey league in the 2013–14 season. There are 12 member schools in the ECAC. Beginning with the 2006-07 season, all schools participate with men's and women's teams, making ECAC Hockey the only Division I hockey conference with a full complement of teams for both sexes. 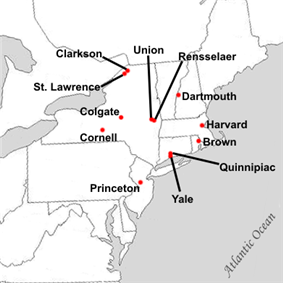 The six Ivy League universities with Division I ice hockey programs are all members of ECAC Hockey. Neither the University of Pennsylvania nor Columbia University has a varsity intercollegiate ice hockey program. Penn supported an intercollegiate varsity hockey program in the past and was an ECAC Hockey member from 1966 to 1978 before the team was disbanded. The Ivy school that has the best record against other Ivy opponents in regular season ECAC games is crowned the Ivy League ice hockey champion. The Ivy League schools require their teams to play seasons that are about three weeks shorter than those of the other schools in the league. Thus, they enter the league schedule with fewer non-conference warm-up games. Harvard competes in the annual Beanpot Tournament and Cornell hosts a holiday tournament in Estero, Florida. The winner of the game is awarded the Whitelaw Cup and receives an automatic bid to the NCAA Men's Division I Hockey Tournament. The Cleary Cup, named for former Harvard player and coach Bill Cleary, is awarded to the team with the best record in league games at the end of the regular–season. There is no tie–breaking procedure should two or more teams end the season with the same record and the trophy is shared. A tie breaking procedure is applied to determine the top seed in the ECAC conference tournament. The Cleary Cup winner is not given any special consideration in the NCAA tournament as the ECAC awards its automatic bid to the winner of the ECAC tournament. At the conclusion of each regular season schedule the coaches of each ECAC team vote which players they choose to be on the two to four All-Conference Teams: first team and second team (rookie team starting in 1987–88 and third team beginning in 2005–06). Additionally they vote to award up to 7 individual trophies to an eligible player at the same time. ECAC Hockey also awards a Conference Tournament Most Outstanding Player as well as an All-Tournament Team, which are voted on at the conclusion of the conference tournament. Three awards have been bestowed every year that ECAC has been in operation while the 'Best Defensive Defenseman' was retired from 1967–68 thru 1991–92 and the All-Tournament team was discontinued from 1973 thru 1988. In 2000, St. Lawrence University won the longest game in NCAA tournament history. St. Lawrence defeated Boston University in quadruple overtime by a score of 3–2. Currently, this game is the fourth longest game in NCAA division I history. 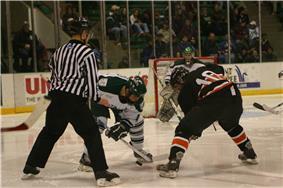 On March 4, 2006, Union College played host to the longest NCAA men's ice hockey game in NCAA history. In Game 2 of the first round of the 2006 ECACHL Tournament (best of three series) between Yale University and Union, Yale won 3–2 1:35 into the 5th overtime. Overall, the game took 141:35 to decide the winner. 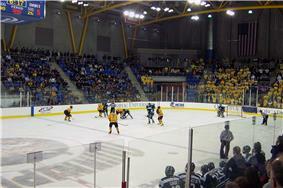 On March 11, 2010, Quinnipiac defeated Union College 3–2. The game, which lasted 150 minutes and 22 seconds, set a new record for the longest hockey game in NCAA history. The record lasted until March 6, 2015 when a Hockey East playoff game between UMass and Notre Dame lasted just over a minute longer. Cornell University recorded the only undefeated and untied season in NCAA Division I Hockey history in 1970.
Colgate University holds the record for most overtime games played in a single season, set in 2008–09 with 19. ^ "History of ECAC Hockey". College Hockey Historical Archives. Archived from the original on January 29, 2013. Retrieved January 29, 2013. ^ "Women's Season Summaries" (PDF). ECAC Hockey. Archived from the original on January 27, 2013. Retrieved January 27, 2013. ^ Brown's website characterizes it as "the Baptist answer to Congregationalist Yale and Harvard; Presbyterian Princeton; and Episcopalian Penn and Columbia," but adds that at the time it was "the only one that welcomed students of all religious persuasions." Brown's charter stated that "into this liberal and catholic institution shall never be admitted any religious tests, but on the contrary, all the members hereof shall forever enjoy full, free, absolute, and uninterrupted liberty of conscience." The charter called for twenty-two of the thirty-six trustees to be Baptists, but required that the remainder be "five Friends, four Congregationalists, and five Episcopalians"
^ "Gostisbehere, Bodie, Carr earn spots on ECAC Hockey All-League Teams". Union Athletics. 2013-03-21. Retrieved 2013-08-01. ^ "ECAC Hockey Awards". College hockey Historical Archive. Retrieved 2013-08-01. ECAC Hockey to Celebrate 50th Anniversary (September 8, 2010 press release). ECAC Hockey official website. Retrieved 2010-09-25.